Last night, my friend Anne and I were simply peeking in a church in the nearby town of Motta St. Anastacia, commonly called Motta (MOE-tuh) by all the Americans, when we were singled out by some of the locals. I guess that they saw I had a camera, because they insisted that I take a photo of their church "to take back to America." At least, that's what we think they were saying, as it was all in Italian and seemed to make sense in context. As usual, they were sitting on kitchen chairs right on the street, watching traffic and life go by. In Motta, there are few sidewalks, squares, or parks, so people just take their kitchen chair out on the streets and sit in the summer evenings. These four gentlemen were quite proud of their church, St. Anthony of Padua, which was very unusual, with an exterior that looked like it was banged out of aluminum foil. Anyway, I pretended to know what they were saying and gestured for them to get into the photo. They posed proudly, and this photo was the result--a very good representation of Motta in summer. Aha! 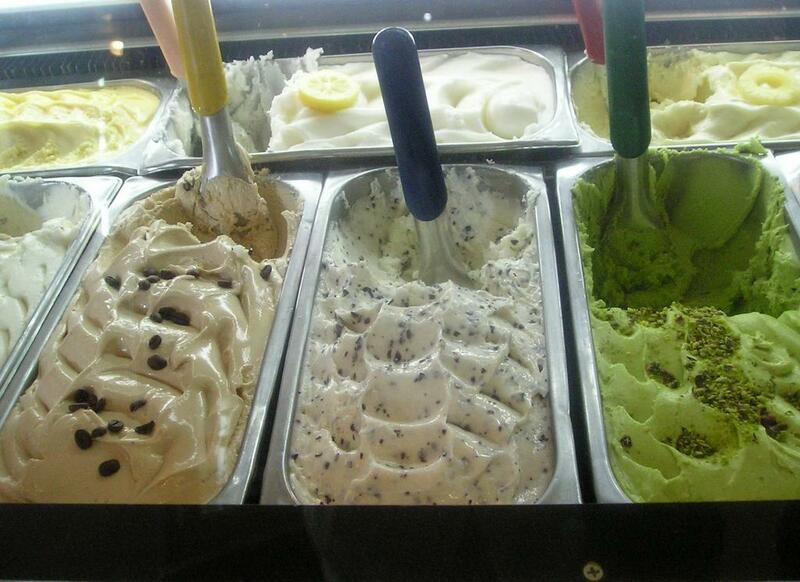 Just as I had heard, ice cream was invented in Sicily. I came across this article today in, of all places, a Sioux Falls, South Dakota, newspaper, The Argus. Trained chef and baker Sanaa Abourezk writes: "The most likely reason was the existence of the volcano Mount Etna, which is high enough to maintain snow in its higher elevations year-round. That was where the Sicilians harvested snow to cool their drinks and freeze their desserts. Mount Etna was special because it spewed out volcanic ash, preserving the snow with an insulating blanket. "Later, Roman emperors sent their wine to be cooled in the caves of Mount Etna. Eventually, Sicilians began preserving the snow underground, allowing it to convert to ice, which they sold as far away as Rome. In the 10th century, Arabs came to Sicily, bringing with them cane sugars and citrus fruit and mixing them with ice, resulting in a sort of snow cone or sorbet. That was the beginning of the world's romance with ice cream. "Ultimately, the Roman Catholic Church took control of the ice, selling it throughout Italy and experimenting with the sweetened snow by using different flavors. Almond water, pistachios and fruits were added until, finally, milk was added, creating the final product we know today. 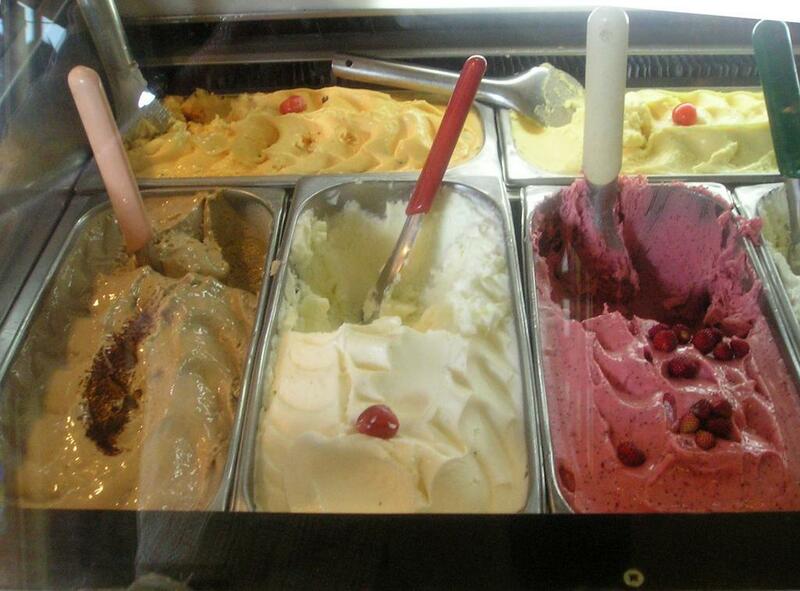 By the 1600s, Sicilian ice cream makers became famous throughout Italy. "In 1774, the supply of snow in Mount Etna gave out, and the Sicilian parliament in Palermo dispatched dragoons to Mount Etna to confirm there was no snow. "I've eaten ice cream in various parts of Europe and the Middle East - I've heard the Russians make an exquisite ice cream - but in my opinion, Italy makes the best in the world. Gelaterias, Italian ice cream shops, are handed down from generation to generation, with the secrets of the family retained within the family." Ha! It is true that most of the gelaterie here make their own ice cream and granite (gra-NEE-tay), which really is more like a fresh sorbet. Almond is my favorite, but I also like the mulberry. You have to ask what they have that day. The Italians eat it for breakfast in the summer, with a warm, sweet brioche on the side. I have adopted this habit myself on Sundays at my favorite cafe. Other popular flavors here are pistachio, peach, lemon, strawberry, coffee, and mint, all of which are grown or brewed here in summer. One question, why do you think the snow disappeared in 1774? A volcanic eruption is my first guess. An earthquake? An unusually hot winter? There is plenty of snow on it these winters, I can testify. I will have to do some research. In the meantime, if you like Italian ice cream, you should come to Sicily for the original stuff. I'm back in Sicily after twenty-five days in the USA. I was afraid it would be a letdown after the glamour of San Diego, the wide open green Midwest, trendy Cape Cod, and the pristine cleanliness and efficiency of everything everywhere. 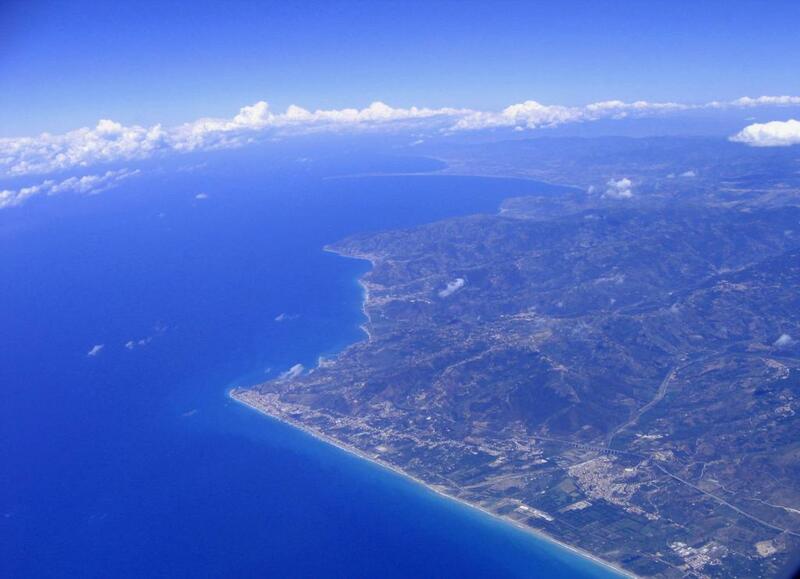 But, even after twenty-four hours, three airlines, and one lost suitcase, Sicily looks and feels good. It's August and warm and dry, not a hint of humidity. The entire island is sun-burnt, but the palm trees and tropical flowers are glorious. The produce vendors are selling melons and tomatoes for pennies. Scooter drivers are still bats out of hell. 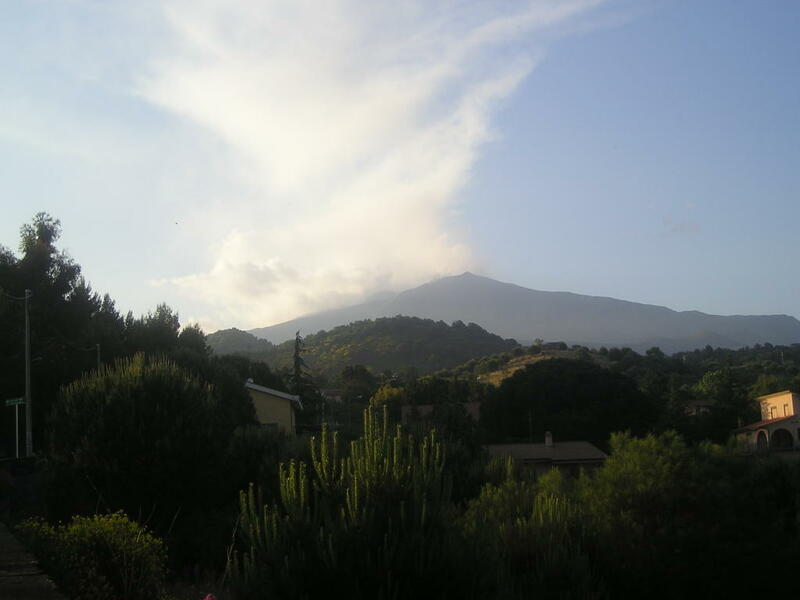 The dogs aren't barking too much and Monte Etna is puffing white steam boldly against the deep blue sky. I have temporarily forgotten every word of Italian I ever know. I know it will come back. Pete and Repeat had a ribbon-bedecked "Welcome Home Mom XXXXXX" sign near their cat food in the garden shed. They couldn't stop miaoing and rubbing against me. I finished reading Theresa Maggio's The Stone Boudoir on the trip back, the perfect way to transition back to life on this island. I heard that she is coming to Sicily this winter to film a documentary. I hope to meet her. I have been thinking of having some of my students read excerpts from her book. Maybe, they, too, can meet her. It's funny . 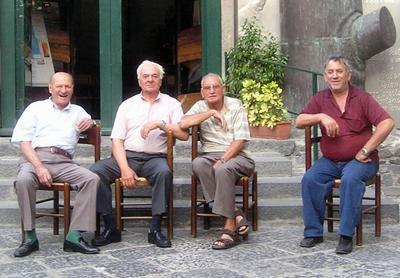 . . on this trip, I met people all over the country who have been to Sicily. Without exception, they all were charmed by it and want to come back. Theresa Maggio writes, "Returning to a familiar place is part of the pleasure of travel for me." I have to agree; it is also part of the pleasure of living abroad. America is ready for creepiness. On the plane from Detroit to Chicago, my seatmate excitedly told me about the Bodyworlds exhibit at the Museum of Science and Industry that he was going to see, and a few days later, my stylist at Vidal Sassoon did the same! She, at least, declined to visit it, finding it vaguely creepy, like me. I have been reminded of a fourth "Famous Creepy Thing" I've seen (and you'll want to, too) . . . the "Iceman" named Oetzi in Bolzano, Italy. See the real, frozen body of a man from the 4th millenium B.C. found not long ago in the Alpine snowfields. Woo-hoo!